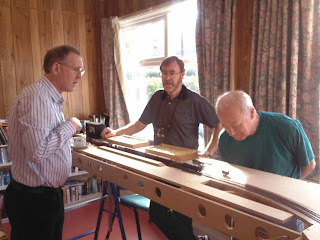 A good turnout of model makers, modelling tools and wagon kits.....! 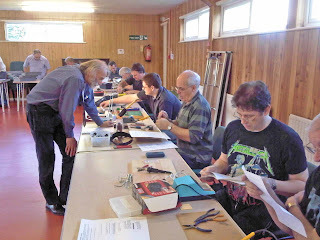 I counted 10 soldering irons in operation at the North East Group Meeting today. Members responded well to the 'bring a wagon chassis along and build it' call and as the pictures show there was much activity. Bob Jones brought part of Fence Houses (the boards with plain track theron) for the purpose of testing anything that was constructed during the course of the afternoon together with any locomotives that were produced. The 9F was present along with Tony Simm's N* 0-6-2t. Both of these locomotives have featured on the blog before. A good tiime was had by all, especially around 4pm...........!